With kind permission from University of New Mexico Press for the cover image from C. Schmidt-Nowara, Slavery, Freedom & Abolition. (New Mexico, 2011). Christopher Schmidt-Nowara completed his PhD at the University of Michigan and taught at Fordham University, New York City, and then Tufts University, Massachusetts, where he was Prince Asturias Chair in Spanish Culture and Civilization. Through a series of monographs, edited collections and commentaries that focused on the Hispanic world, he stressed the importance of the transatlantic flow of ideas, people and resources, in shaping modern experiences and identities. Cuba and Brazil were the last countries in America to abolish slavery (in 1886 and 1888). His first book Empire and Antislavery: Spain, Cuba and Puerto Rico, 1833-1874 (1999) examined the development of pro- and anti-slavery movements in colony and metropole, demonstrating the interplay between these sites. The history of liberalism, the public sphere, and the development of transatlantic political alliances in re-ordering colonial power, were important themes of Empire and Antislavery that he developed elsewhere in books, essays and conference reports. In his most recent monograph, Slavery, Freedom and Abolition in Latin America and the Atlantic World (2011) Christopher Schmidt-Nowara provided an authoritative overview of the global relationship between Iberia, Africa, the Caribbean and Latin America (extending his critical eye to Brazil as well as the Antilles) since the fifteenth century. 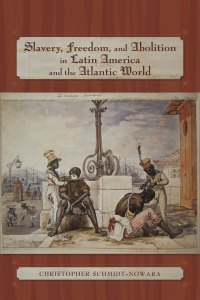 Most recently, in 2011, he guest-edited a special issue on ‘Caribbean emancipations’, which included contributions from Miranda Frances Spieier, Astrid Cubano Iguina, Camillia Cowling and Jesse Hoffnung-Garskof (vol. 36.3). Through cases studies of Cuba, Puerto Rico, Brazil and French Guiana, the contributors explored the complex quotidian struggles between slaves and freed people, masters and the colonial state, over liberation and the meaning of freedom after slavery. In 2004 he guest-edited a special issue with Mónica Burguera on Modern Spain and Spanish Historiography, which included major contributions from Jesús Millán, María Cruz Romeo, Isabel Burdiel, Ismael Saz Campos and Adrian Shubert, as well reviews of recent works in the field (vol. 29.3). In their important introductory essay to the 2004 special issue, Burguera and Schmidt-Nowara rejected the entrenched historiographical characterisation of Spain as intellectually and economic backward, which has led to its marginalisation within narratives of European modernity. They argued instead that the study of Spain and the Spanish transatlantic was central to the shedding of ‘new light on questions at the heart of contemporary European historiography, including the causes of general processes of social and political change; the formation of cultural and gender and national identities; and the consequences of imperial conquest and decolonization’ (vol. 29.3, 283). In taking this agenda forward, historians of Spain, Europe and the transatlantic world will provide a fitting tribute to Chris and his work.